From medicine to education, evidence-based approaches aim to evaluate and apply scientific evidence to a problem in order to arrive at the best possible solution. Thus, using scientific knowledge to inform the judgment of managers and the process of decision-making in organizations, Evidence-based Management (EBMgt) is the science-informed practice of management. Written by leading experts in the study and practice of EBMgt, The Oxford Handbook of Evidence-based Management provides an overview of key EBMgt ideas and puts them in context of promoting evidence-based practice. Furthermore, it addresses the roles and contributions of practitioners, educators, and scholars - the primary constituents of EBMgt - while providing perspectives and resources for each. Divided into three sections (research, practice, and education), this handbook examines the realities of everyday management practice and the role EBMgt can play in improving managerial decision making and employee well being and instructs educators in their roles as designers of curricula and resources. 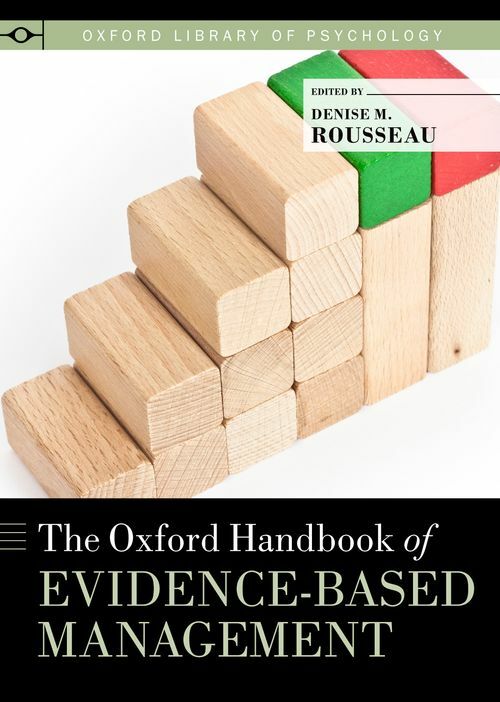 As the first major volume to capture the spirit of this emerging movement, The Oxford Handbook of Evidence-based Management shows how practitioners can use high-quality knowledge gleaned from scientific research in order to make better use of available data and ultimately make more mindful decisions. 13. Decision Logic in Evidence-based Management: Can Standard Business Logical Models Make Managers Better Human Resource Decision Makers? Denise M. Rousseau, Ph.D., is the H.J. Heinz II University Professor of Organizational Behavior Management Collaborative at Carnegie Mellon University.